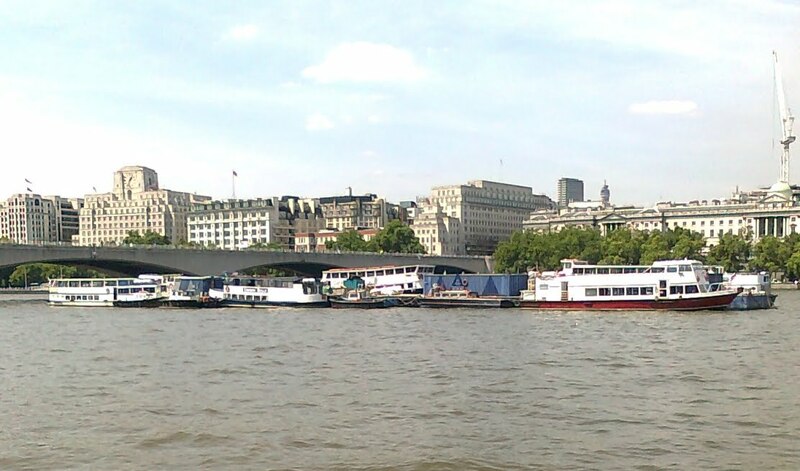 All these cruise boats which normally run tourists up and down the Thames have been laid up on this mid stream mooring in the centre of London for a few weeks now. Perhaps its down to the UK economy or maybe some other reason. 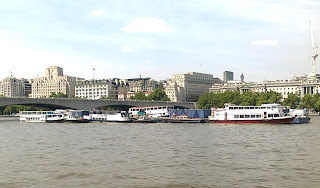 Are the cruise operators assembling a fleet in readiness for next year's Olympics? Is this the part of the Government's plans for a floating prison? Could it be the latest buy to let or affordable housing? 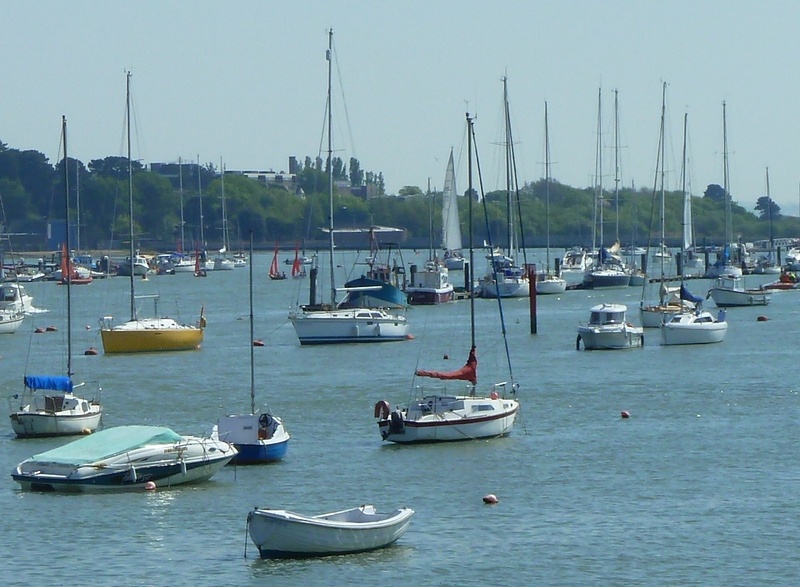 Is there a marine Scrappage scheme? 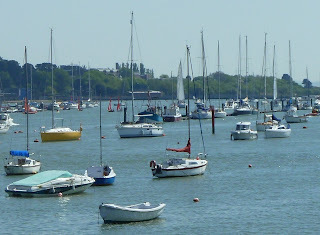 We were sitting by the slipway watching as a fleet of Optimists and their support boats were recovered from the river when a large rib drive straight towards the slip way, no sight of a trailer or trolley in sight. 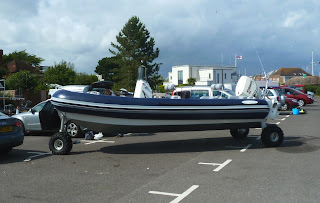 It didn't stop, instead rose out of the water on three large squashy tyres and proceeded to drive off through the dinghy park, the helmsman in full control. 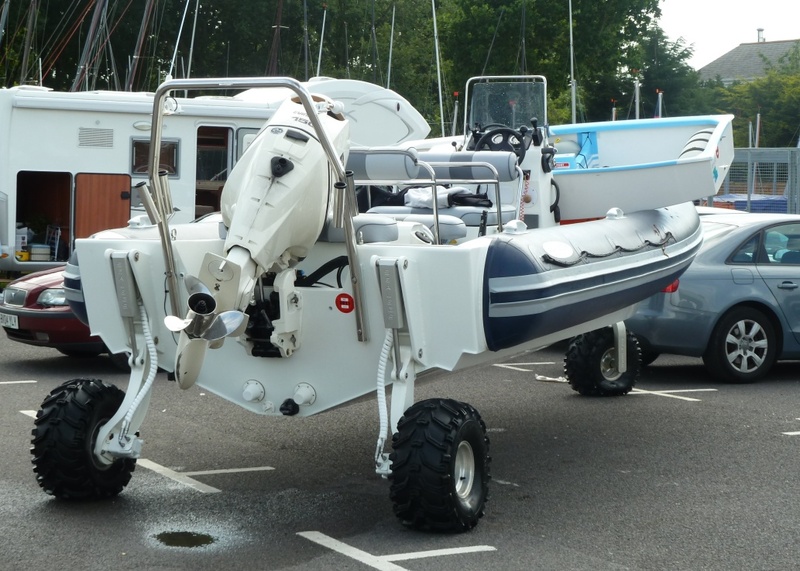 Closer inspection shows that the rib is fitted with Sea Legs hydraulically operated struts and powered wheels which fold down to provide amphibious capability. Work on the SCOW has been painfully slow all year, but I've finally got around to repairing the deck. The old patterned non slip deck was so crazed that I just sanded it all back flat with an angle grinder. 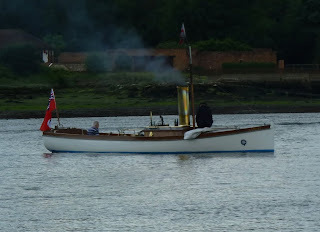 Spotted this open gaffer heading up river in breezy conditions, I don’t know if she’s a local boat or a visitor, she looks like she might be a Tosher. 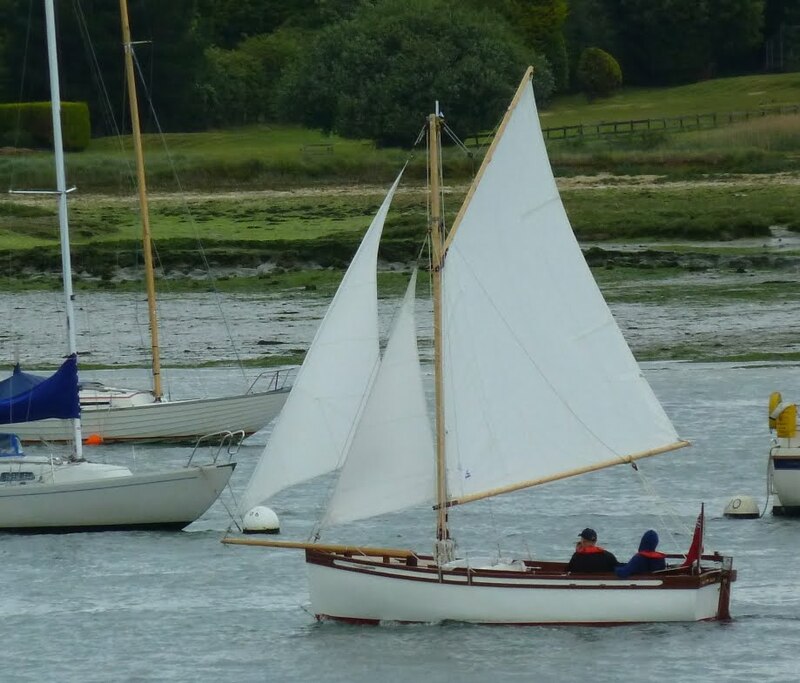 A version of the tradional west country boat has been made in GRP for many years by Martin Heard's yard down in Mylor Creek, but we were too far away to tell if this one was GRP or wood. 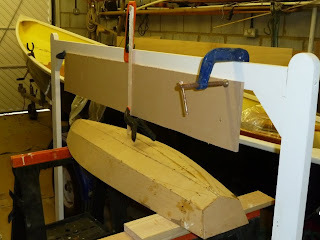 I've started building a model yacht for Joe and rather than do the sensible thing and buy plans I decided to scale down and modify the hull shape I used for Gato Nego my rowing skiff. With a beam to length ration of 4:1 the hull should be easily driven, I also flattened out the stern section to hopefully give better form stability and the possibility of planning. All of which sounds about right and I’m no expert, but at least with a model you can experiment without breaking the bank. The next challenge is to position the rig, keel and rudder, I decided that I needed to draw up plans, so having already built the hull pretty much by eye I needed to get an accurate drawing of the underwater profile. Using the home made gantry (I knew it would come in useful for something), a spilling board and a stick I was able to capture the hull profile with reasonable accuracy. Next step is to draw it up with the sail plan, keel and rudder, then calculate the Centre of Effort of the sails and the Centre of Lateral Resistance for the underwater section. Most of the design guidance suggests a “lead” CoE over CLR of some 10% -12% of water line length. Whether that works at model scale I’m not sure (some more research needed), getting it right is important if the boat is to sail well. 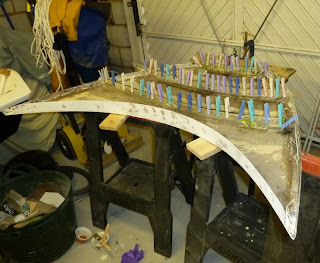 To complicate matters the keel and rudder when I decided where to put them and how big, will also change the underwater shape and CLR, which will change the lead and so on. Interesting stuff this yacht design. 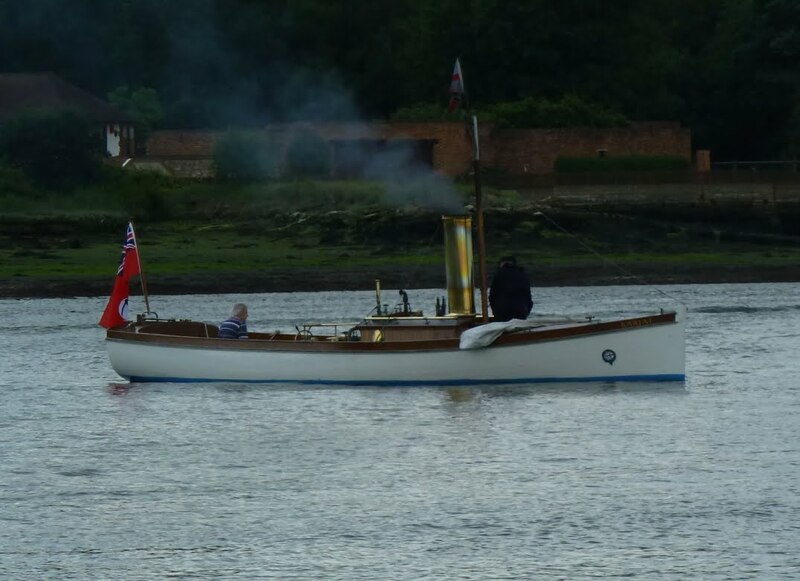 This steam boat was out on the river at the weekend, it was delightful, slipping along almost silently with that faint, fresh smell of steam and coal as it passed by. Walking along the South Bank yesterday just after lunch it was obvious that there was a serious fire over near the Strand. 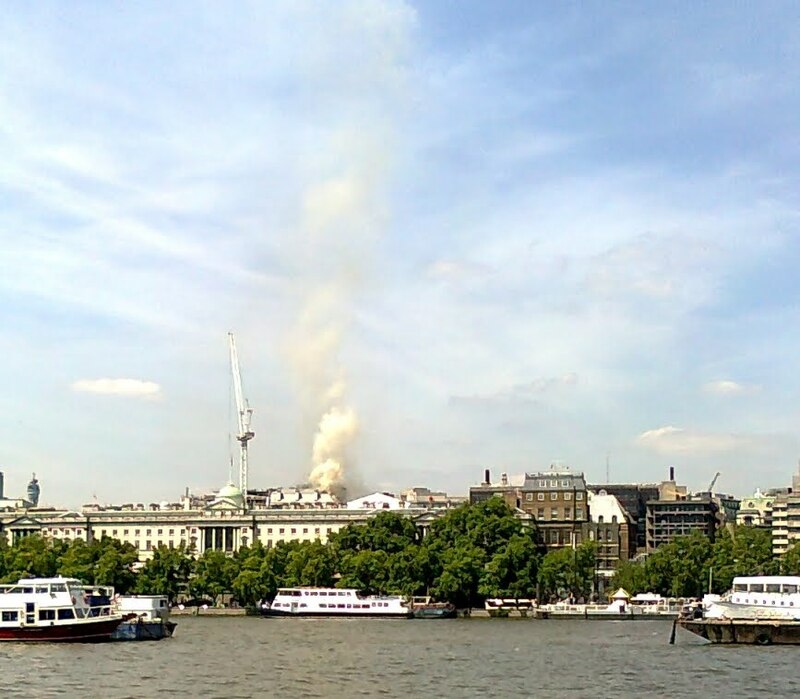 I had a meeting over near Gresham Street and on the way back heard from the taxi driver that the Strand was closed and around a dozen fire engines and vehicles. We dropped by our friends Jax and Robbie to deliver one of Erica’s cakes as they are just about to depart for an extended cruise, destination unknown, most likely the Caribbean, perhaps the Pacific and even the very edge of the known world. With just days to go I’m sure they won’t mind when I say there was a certain tension on board. The boat was just full of stuff, stuff which hadn’t found a permanent home, stuff which was being moved from one place to another and stuff which was needed for those all too numerous last minute jobs. It was all very familiar and brought back fond memories from when Erica and I set out for the Caribbean. It all finds a place, it all sorts out and finally land, home, friends, are all left far away, below the horizon and you can relax and enjoy the voyage. 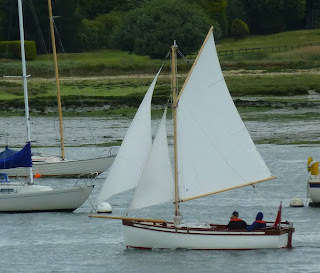 With the appalling weather since Sunday it doesn’t look as though they will get away much before the middle of the week, but that’s one of the delights of cruising, no deadlines and if the weather isn’t right then don’t go. 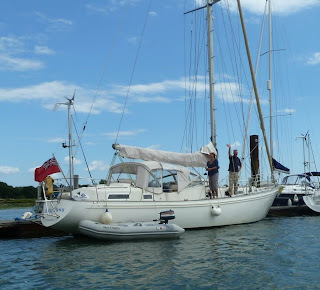 You can follow their blog - search for Spring Dawn, which incidentally is a Rival 41 a tough and renowned seagoing boat. First of all there were a few seemingly random thefts of outboard motors on the river, then a couple of weeks ago several were stolen in one night from boats moored on the outside pontoon in a local marina. The police and insurance companies have made great strides preventing outboard theft through database registration systems which make selling on stolen engines very difficult, so it was puzzling how such a large number of stolen outboards would be sold on. 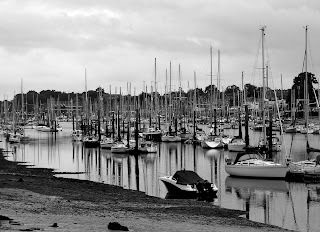 The clue came last week when a number of aluminium masts were stolen from the dinghy park on the Hamble foreshore. With the seemingly inexorable rise in commodity prices the value of scrap aluminium is very high so presumably these stolen marine items are being melted down and are untraceable. 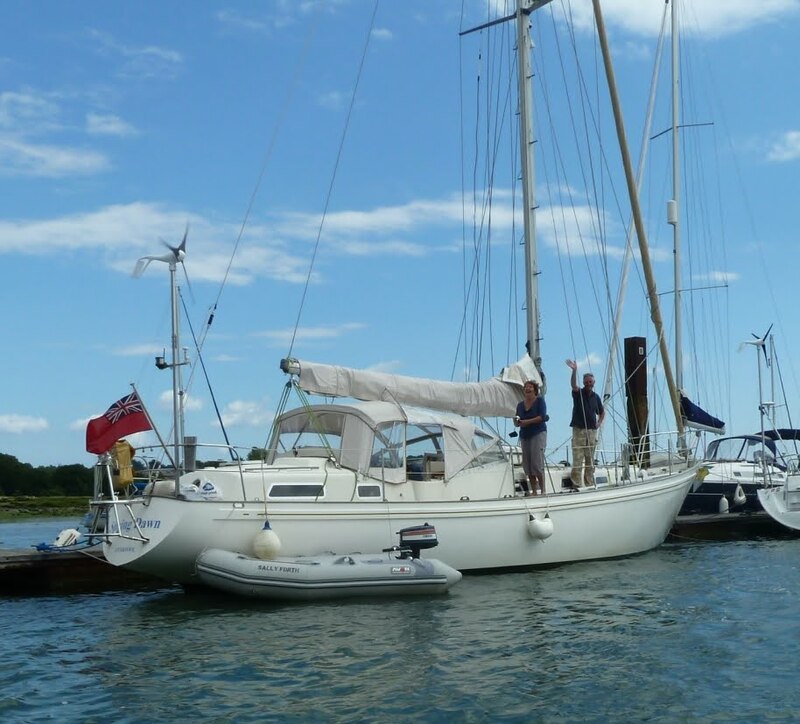 While this might be an organised racket these are hardly master criminals at work, what these dopey "tea leaves" didn't realise as they carried off the outboard from one particular boat was that there was 600lbs of lead ingot ballast just under the floor boards. Lets hope the police catch them soon. Opps I very nearly trod on this guy or more likely gal at the Lepe Country park. 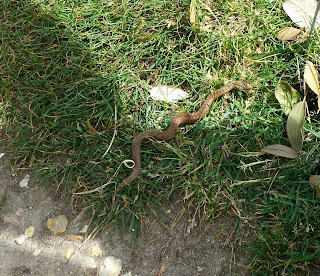 It was making it's way across a dirt pathway and was pretty well invisible. From the markings on the back it looks like an Adder or Viper (vipera berus) which is apparently the only venomous snake in the UK. Actually from reading they seem pretty harmless and people normally only get bitten while trying to catch or handle one (or possibly treading on one) and a bite is very rarely fatal. They grow to around 60 or 75 cm, although this one if you stretched it out fully was not much more than a foot long (30cm), the brown colouring suggest it's a female. After our brief and close encounter she moved off into a peaceful spot at the top of a low cliff in the bright sunshine. 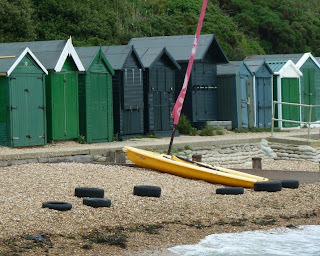 With only three weeks until the summer solstice, last week's bank holiday Monday was not atypically characterised by the low grey clouds, high winds and just a bit of rain. 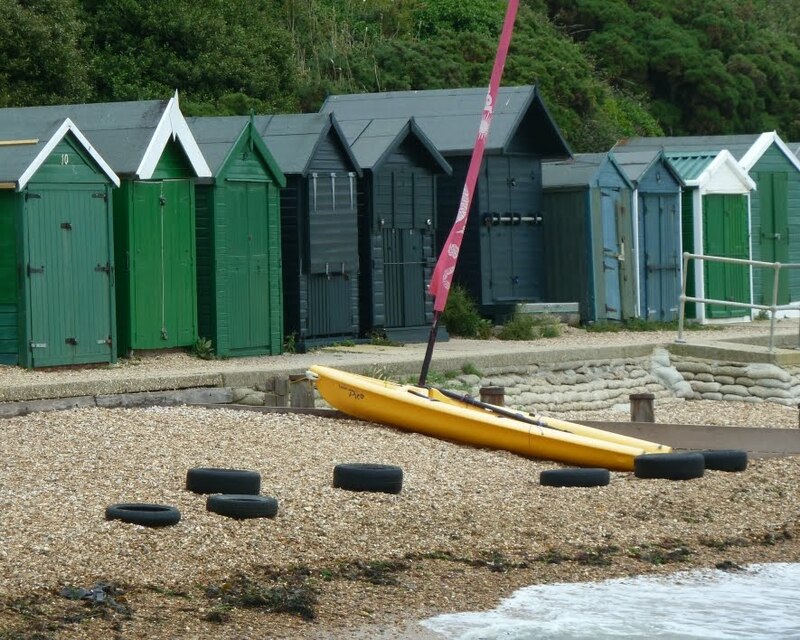 Down on the foreshore the beach huts were closed and securely locked up, with a lone dinghy pulled up on the shingle well above the high tide. 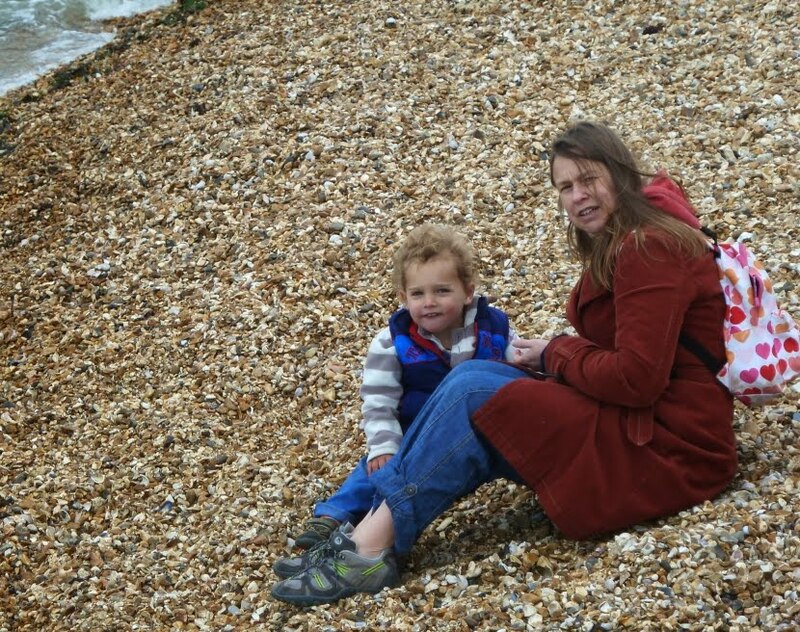 But it's a holiday weekend so we just had to make the effort to go and play on the beach, even if it meant wearing our coats and very definitely not staying too long. 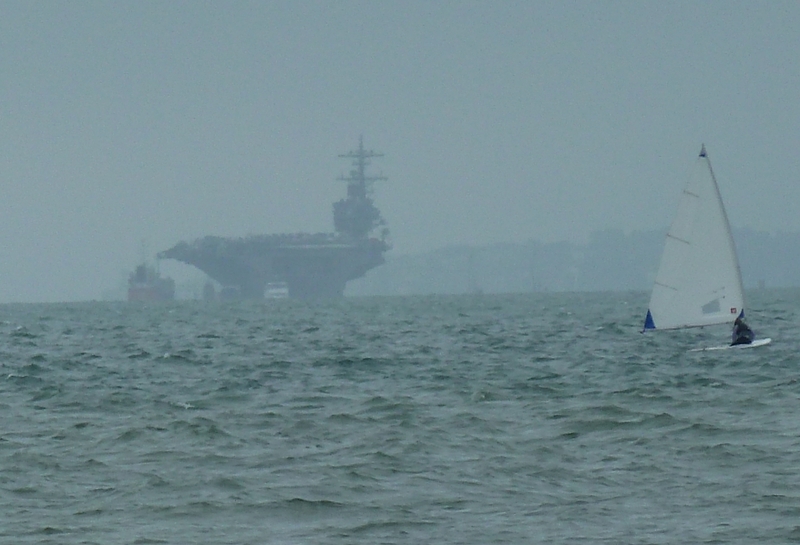 For avid sightseers the USS George W Bush was still anchored out in the grey on grey Solent seascape. 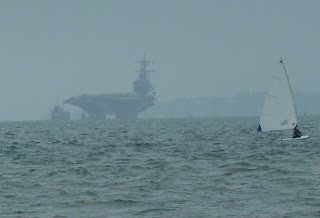 Lets hope for better weather this weekend. 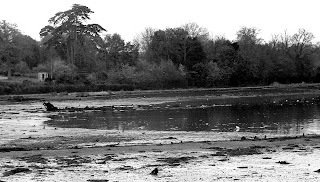 Two of our local pubs have some fantastic, old, black and white photographs showing river scenes from years ago. Walking along by Swanwick pool it's easy to imagine things haven't changed much in the last 70 years or so. 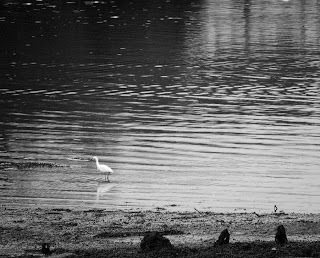 Egret's are still common on the river, this was wading in the peaceful shallows, close by the shore. 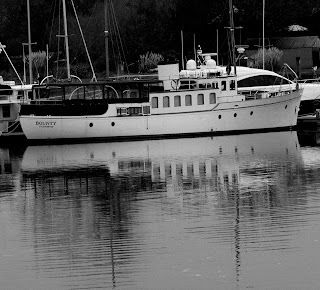 You could imagine this handsome motor yacht Bounty, gliding along the river, faint 30's jazz music drifting across the still water in the rippled wake as she steams away. Sadly the reality is, that you don't have to look very far to see the effects of development and crowding which have characterised the last seven decades. But it's still a great place to live!